I love finding bits of old pottery in the lanes around Leomansley. I was told by the archaeologist at the Polesworth Abbey dig last year that there are two types of pottery finds, those that indicate occupation of the land, and those that have been deposited there, through processes such as manuring (1). Two of my most interesting finds (Disclaimer: interesting to me that is! Don’t get too excited, we aren’t talking Leomansley Hoard here!) were in the lane leading from Christ Church Lane, past Martin Heath hall and ending at the football field on the A51 (I have seen it referred to as Moggs Lane). Judging by old maps, it seems to have existed for at least 180 years. I found this girl guide badge, and it made me think about the old scout hut behind Martin Heath hall that was replaced by a new one in September 2009. The old hall was a bit of a wreck, and quite clearly needed to be replaced, as you can see from these photos here, but I’m glad someone did document it as it has an interesting history. Apparently, it started life as a WW1 cadet hut at Cannock Chase. It was then acquired by the Electricity Board and found its way to Queen St, Lichfield. In the 1950s, it was donated to the scouts and was relocated to Christ Church. 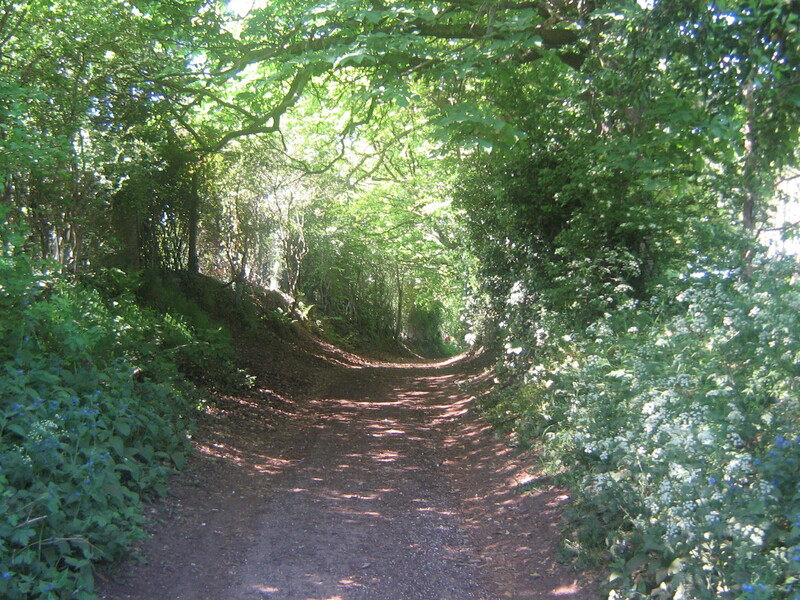 The lane past Martin Heath hall, off Christ Church Lane. I also found this piece of pottery. Unlike most of the other bits I find, this had a very distinctive pattern i.e. a dog! and I thought that because of that it might be easier to find out more about what it was part of and how old it was. Thanks to extensive googling, using phrases like ‘dogs on bowls’, I eventually sifted through the many, many pet feeding related search results to find that it was possibly a Brampton stoneware jug from the early to mid-nineteenth cenutury, featuring a pattern known as ‘The Kill’. Yes, my pottery sherd depicted a dog tearing a fox to shreds. Nice. I know from reading old newspaper articles that once upon a time, not so long ago, Leomansley was quite the hunting ground. The Lichfield Mercury used to carry reports of the hunts through Leomansley and Sloppy Woods. 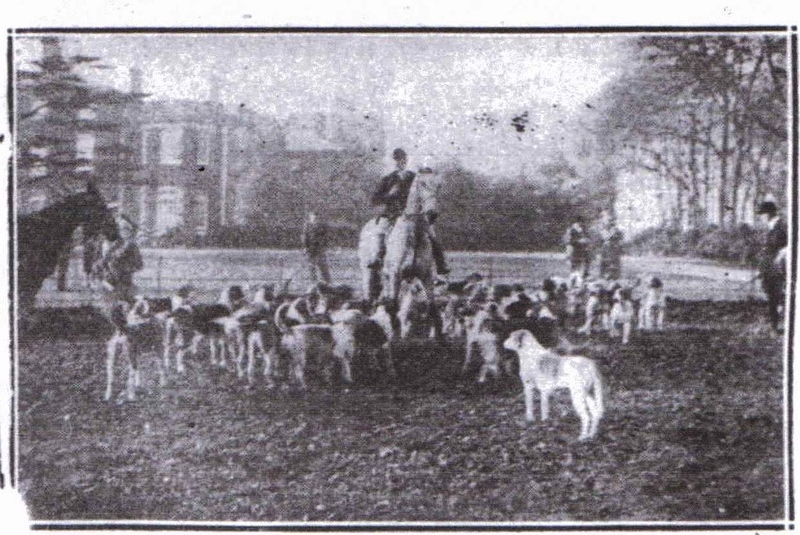 This photo is from a 1936 edition of the Mercury, and shows the South Staffordshire Hounds gathered at Maple Hayes. I have no idea whether the pottery sherd is related to this in anyway, but I thought it was an interesting find, especially in view of this past association with hunting. A little echo of the area’s history that managed to worked its way free of the soil. PS Off to have my own hunt in Leomansley Woods later. This time for bluebells. (1) Domestic rubbish such as broken pots was mixed with the animal manure and then spread on the fields to fertilise the soil. 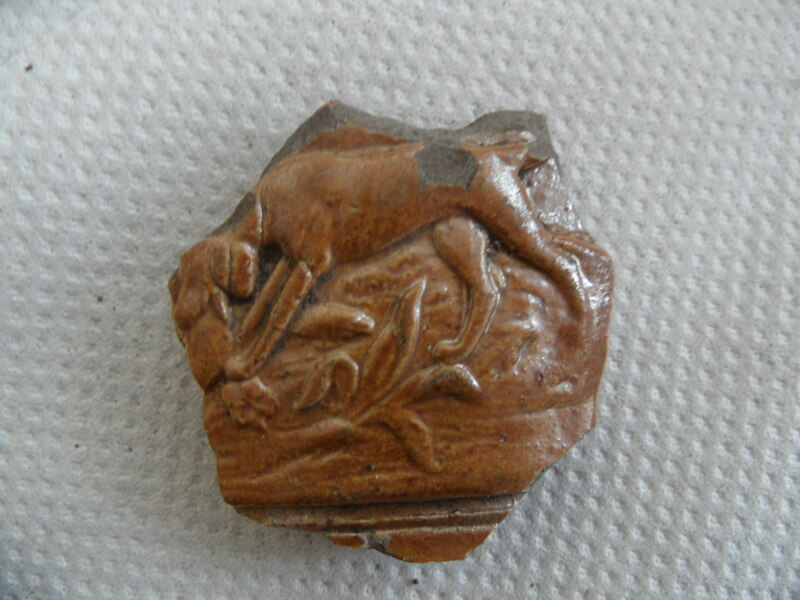 This entry was posted in archaeology, Leomansley, Lichfield and tagged archaeology, Christ Church, finds, history, hunting, leomansley, Lichfield, Lichfield history, Maple hayes, pottery by Kate. Bookmark the permalink. guides ,Some badges were enmamelled in different colours. Thanks Pat. 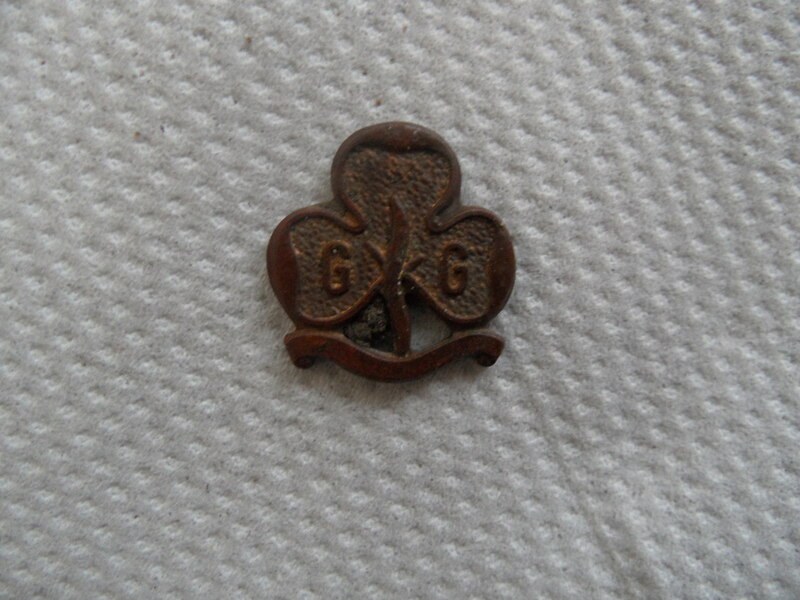 It has registered trademark Girl Guides on the back. Think it’s funny someone dropped it years ago & I just found it. Wonder if they still live around here? Hey Simon. It’s looking good over there! Now the conduit heads eluded me for ages.. I did eventually find them. In fact I did a post about them. However far more fun to go & find them yourself! What I will tell you is they are most easily accessed from Pipe Hall Farm in Burntwood owned by the Woodland Trust. There is a car park you can start from. Or you can go the long way round & go up Abnalls Lane. Lovely view of Lichfield from there too! Happy hunting! Me again ..If you Google Royal C Doulton, hunting jugs show up there.. there’s even one for sale on e-bay! lol ..
Oooh brill. I’ll have a look now! Of course not! That’s brilliant thanks. And it’s good to know I’m not the only archaeologist botherer out there 😉 I think it’s so much better when it’s a group effort!